Kids returning to school Tuesday at four LAUSD campuses were met with temporary fencing around some grass and dirt areas to keep them from walking through or playing on lead-tainted soil. KPCC reported in July that over the past two years, the state Department of Toxic Substances ControlÂ has found elevated levels of lead at five L.A. Unified schools near the old Exide lead battery recycling plantÂ in Vernon. Until now, the agency hasnâ€™t removed the contaminated soil. Last week, Toxic Substances Control took another step: It collected additional soil samples from four of the schools: Lorena Street Elementary School, Rowan Elementary School and Eastman Avenue Elementary School in Boyle Heights; and Fishburn Avenue Elementary School in Maywood. 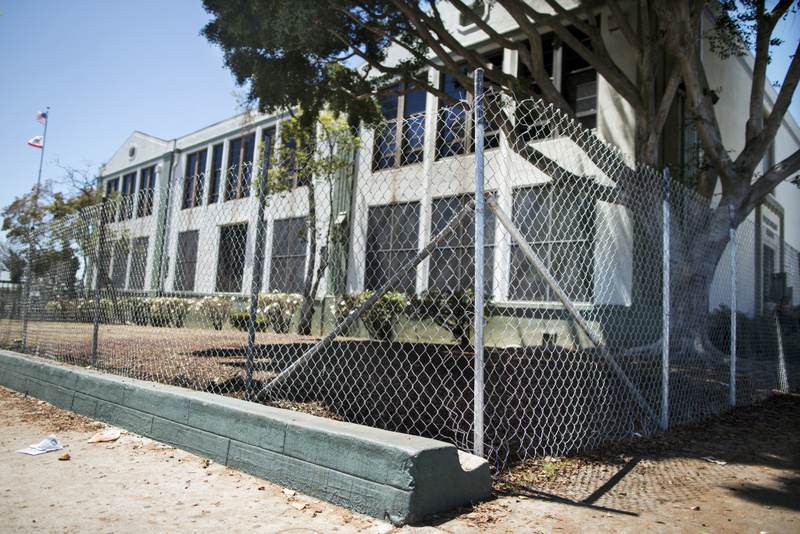 In an Aug. 2 letter to L.A. Unified, Toxic Substances Control suggested that the school district erect temporary barriers such as fencing, mulch or other ground cover to keep children from interacting with contaminated soil at three schools: Lorena, Rowan and Fishburn. On one campus, Eastman, the district had already removed contaminated soil from two tree wells. The state determined that no further action is needed at the fifth school,Â Huntington Park High School,Â because its students are older. Lead is particularly harmful for young children and pregnant women. It is a neurotoxin that can cause learning deficiencies and brain damage. AtÂ Lorena Street Elementary it set up temporary fencing around the exterior dirt yard on the east side of the campus nearest Lorena Street. AtÂ Rowan Avenue Elementary it installed temporary fencing around one tree well in the playground and around a planting area near a classroom building. It erected temporary fencing and reseeded a lawn on the west side of the campus. At Fishburn Avenue Elementary School it erected temporary fencing and reseeded the front lawn on the east side of the campus. Exide smelted lead batteries in the area for three decades on a temporary permit before the state shut it down last year. The soil sampling and cleanup area has grown from around 200 homes closest to the plant to a radius of 1.7 miles that could include up to 10,000 homes. In February Gov. Brown earmarked another $176 million for the cleanup. Twenty-two schools are in the expanded area and they have all been tested, according to Toxic Substances Control. Seventeen were cleared because they did not show lead levels above 80 ppm â€“ the state threshold for residential cleanup. Schools that showed higher levels required additional review. In 2015 soil tests, Lorena and Fishburn ranged from 144 to 219 parts per million. At Rowan, soil around a tree showed a level of 105 parts per million. L.A. Unified officials said they acted on their own at Eastman because soil samples there had lead levels ranging from 220 to 688 ppm. The district removed the soil around two trees and replaced it with clean soil last year. The state typically removes lead from residential yards if it is found at above 80 parts per million. Toxic Substances Control has determined the action level for lead in schools to be 110 parts per million, based on how much time kids spend there, according to letters the agency sent to L.A. Unified. Community groups and some parents have been pushing the state to remove the contaminated soil from Lorena, Rowan, Fishburn and Huntington Park High. They’ve expressed dissatisfaction with how long the process has taken, and many say families their schools are not keeping them informed about what is going on. At Lorena Street Elementary on Tuesday, a man who identified himself as the principal said the school district had not told him the fence was related to lead-contaminated soil or Exide. The man, who would not identify himself by name, said the fence was installed to protect new grass seeds. The principal at Lorena Street School is Isidoro Franco, according to the school receptionist and Francoâ€™s LinkedIn profile. District officials have said the administration is keeping the principals at the affected campuses up-to-date on issue related to Exide and soil contamination, so they can share the information with parents and staff. L.A. Unified says it expects preliminary results from Toxic Substances Control’s new soil tests by the end of this week. Temporary fencing at Rowan Avenue Elementary School. Children at three elementary schools near the closed Exide Technologies battery recycling plant returned to classesÂ this week to find parts of their campuses fenced off to protect them from lead-contaminated soil. Crews installed temporary fencingÂ at Fishburn Avenue Elementary in Maywood, Lorena Street Elementary in Boyle Heights and Rowan Avenue Elementary in East Los Angeles after testing found elevated levels of the brain-damaging metal in several areas, Los Angeles Unified School District officials said. TheÂ district began putting up fencing last weekÂ under the instructions of toxic waste regulators, who areÂ overseeing the massive effort to find and remove contaminated soil from homes, schools, day careÂ centers and parks near the former recycling facility in Vernon. The fenced-off areasÂ included dead grass and bare soil near classroom buildings and at the base of trees at a playground, as well as front lawns where childrenÂ play, said Robert Laughton, director of the school districtâ€™s Office of Environmental Health and Safety. The actions stem from soil tests that began last year and foundÂ elevated levels of lead at five of two dozenÂ schools within about 1.7 miles of Exide, where regulators believe the soil has been tainted by decades of lead emissions from the plant. ThoseÂ leadÂ concentrations were not high enough to pose an immediate threat to students and staff, authorities said,Â but theÂ stateâ€™sÂ Department of Toxic Substances ControlÂ instructed school officials to cover the areas with mulch or fencing while theyÂ conducted more thorough testing. Lead is a powerful neurotoxin that is most dangerous to young children, who can ingest it through contact with contaminated soil. Even small amounts of lead can lower IQs, reduce academic achievement and cause other permanent developmental and behavioral problems. Mayra Reynaga, who has two children attending Rowan,Â said the discovery of lead at the school is â€œdevastatingâ€ and should prompt a cleanup. Her 11-year-old daughter, Darilyn Musia, said she and her classmates used to do cartwheels and play football in the blocked-off area where lead was detected but were told at a school assembly Thursday to stay away. The toxics agency said that â€œout of an abundance of cautionâ€Â it was coordinating with school officials on â€œsteps to further reduce the low risks at these campuses.â€ Those measures could include grates around trees and reseeding and watering grass areasÂ to reduce exposure to the soil. School district officials saidÂ state regulators notified them late Wednesday thatÂ cleanup would not be necessary at Eastman Avenue Elementary in East Los AngelesÂ and Fishburn in Maywood. The district said it isÂ expecting final decisions in the next day or twoÂ on whether the Lorena and Rowan campuses require cleanup. â€œIf soil remediation is the next step for Lorena or Rowan, LAUSD will do what is necessary to ensure that the school is safe,â€ said Elvia Cano, a school district spokeswoman. The Los Angeles County Health Department in MarchÂ collectsÂ soil samples to be tested for possible lead contamination from the nearby and now-closed Exide battery plant. The latest tests, conducted as recently as last week,Â found lead levels of up to 95 ppm at Fishburn, 203 ppm at Lorena and 333 ppm at Rowan, according toÂ results sent MondayÂ from the toxics agencyÂ to the school district. The highest levels were detected at Eastman. School district officials last year removed contaminated soil around two trees at the school where sampling found lead levels ranging from 220 to 688 parts per million.Â The state found that lead levels at Huntington Park High SchoolÂ were not high enough to require cleanup. The U.S. Environmental Protection Agency considers a soil level of 400 parts per million or higher a health hazard in bare soil in children’s play areas, while California has a more stringent standard of 80 ppm for residential soil. L.A. UnifiedÂ officials said they informedÂ school principals of the fencing and soil testing last week and Â sent robocalls and fliersÂ home to parentsÂ Thursday — two days after classes began. But few of the parents gathered Thursday afternoonÂ outside Rowan Avenue Elementary were aware that the area of grass, dirt and mulch where their children used to meet them was blocked off because of lead contamination. â€œItâ€™s a little dangerous and scary,â€ said Rowan parent Cristine Ramirez, who had assumed the school was only fixing the grass. At a community meeting Thursday evening in Maywood, state regulators faced tough questions from residents frustrated with the pace of soil sampling and cleanup. Several parents demanded to know why they were not informed of the lead contamination found at schools. L.A. Unified and the toxic substances department did not initially notify the public of the elevated lead levels. The school district began posting sampling results online last month after media inquiries. The Exide facility melted down used car batteries, releasing dangerous air pollutants into surrounding communities for decades before being shut down permanently in March 2015 in deal with federal prosecutors. State regulators, who allowed the plant to operate for more than three decades on a temporary permit, now believe up to 10,000 homes acrossÂ half a dozen southeast L.A. County communities may be polluted with lead, presenting the largest soil cleanup they have ever conducted. The effort is expected to take years and hundreds of millions of dollars to complete.